Last week, we launched the Capital Campaign for Our Church Home. This is an ambitious campaign to collect cash and pledges over the next three years to raise $175,000 for current and future repairs to our building. Campaign packages were distributed Sunday, May 7. Those who weren’t here would have had them delivered by a friend or neighbour, or received them in the mail. If you did not get a package, please let Sandra Coulson know. We are seeking volunteers to pick up pledge envelopes on the week of June 11-17 if people haven’t brought them in by that Sunday. You won’t have to make a sales pitch. You won’t have to review the donor’s pledge. Just know the basics of the campaign as outlined in your package. You’ll get a list of parishioners to call and a week to go out and pick up the envelopes. We need about 15 volunteers to make sure it’s a light load for everyone. If you can help, please see Deb Adams. These building repairs are not being done for the sake of the building itself. They are being done in order to shelter and protect and keep safe the programs and ministries that we do at Church of the Ascension and the people who attend them. Our stewardship of our building can never be separated from our love and service to our God. Each week of the campaign, we’re going to spend a couple of minutes during this time to explaining some of the repairs that are needed and then hear about a ministry taking place directly under that part of the roof. 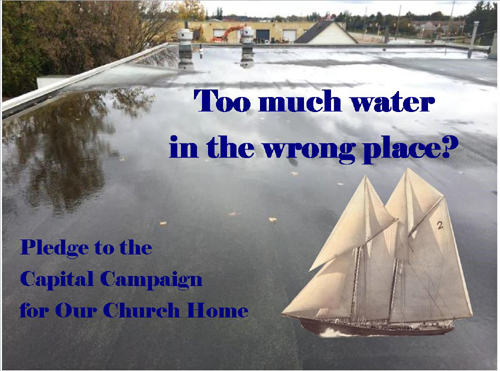 This week, let’s talk about the ponding on the roof over the Parish Hall. 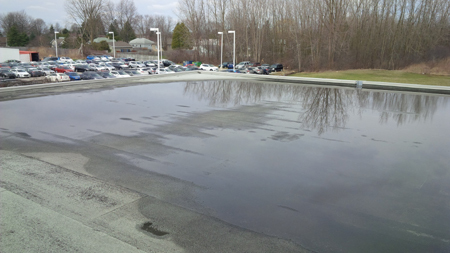 As you can see, a large part of the flat roof is covered in water that cannot easily drain. The drains built along sides and on support columns are now higher than the deck of the roof, which has compressed over the years. 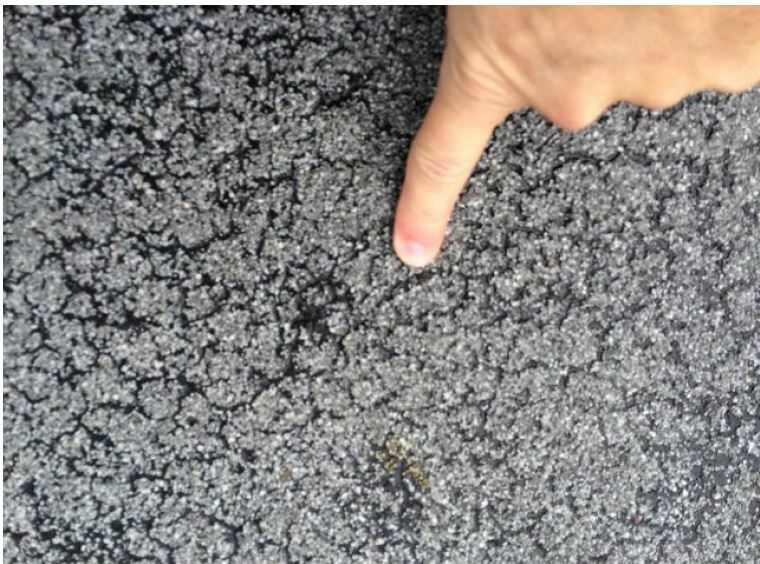 The extra water is causing the roof to blister, lose its surface granules, and age from exposure to sunlight. The Parish Hall is the heart of our community life. It is where we hold Sunday School, Coffee Hour, the Community Breakfast, dinners, and conferences. One of the ministries offered in the Parish Hall is the Friendship Committee, also known as Seniors’ Afternoons or Seniors’ Lunches. This was founded by Christine Brush, Audrey Bullerwell, and Fran Buck. We started this program over five years ago. 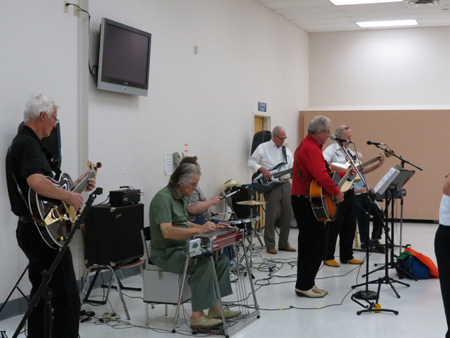 This program is a safe and welcoming environment for seniors in the London area. Our volunteers have been from our church family and now has expanded to the London community. We have been able to provide free lunches, eight months a year. These lunches have been with a complementary musical component. This is provided through the generosity of the London and Windsor area bands and individuals that donate their time and musical talent. The Friendship Committee, through the generosity of our seniors, assists in many other programs in the London area. Over the five years, the seniors have contributed to London Food Bank, Children’s Aid Society, Mission Services residences, Women’s Community House, several nursing homes, hats and mittens for homeless, and The Angel Tree for Seniors for those who are need. A month ago, The Friendship Committee, decided to begin a SMART Program directed by VON. This is held on Mondays and Wednesdays from 8:30-9:30am. This program will assist seniors in balance and mobility in a safe environment by trained VON specialist. Our Facebook page includes comments, suggestions, discussions, videos, and photos of life at Ascension. one another for Christ’s mission in the world. filling us with hope and passion. Amen. The photo collage in the header at the top of each page is made up of words found in some of the 60 stained glass windows in Church of the Ascension. They are words that express our hopes for the best in our congregation, to the glory of God. The purple background represents the traditional colour of the church season of Lent, a 40-day period of repentance leading to Easter. For more information about this site, or to become a member of our parish and/or any of our groups and ministries, please contact the church office at 519-451-7780 or office@ascensionlondon.com, and you will be put in touch with the proper leader or clergy member. The website administrator is Sandra Coulson, who can also be contacted at office@ascensionlondon.com.